If, like me, you come from another country and are a little peeved at the lack in choice of sweets here in Germany, and are looking for something other than the horrific rubber Haribo junk, then there is a place in Friedrichshain for us, Herr Nilsson Godis . I’ve been aware of the place for a while, buying from their stands at the Christmas markets and such, but I’d never actually made it to their shop. So when I went and found that they have a full breakdown of what ingredients are in each of their items with clearly marked allergy labels, I decided that Herr Nilsson Godis might be the best place in the world (well, at least the best place in Berlin for candy). The shop itself is a little on the small side (fortunately, sweets are also small) but the selection is quite varied. Now, your first thought may be something like ‘well, I’ve been to places where they have sweets in bins like that, and they’re usually old/hard/cheap/a bit crap’, and in most cases you’d be right, they usually are. But here they use some kind of magic and everything is as fresh as can be, plus, it is definitely some of the best candy I’ve ever had. From what I could discern, all of their stock is imported from Sweden, who knew the Swedes were so good at making sweets? There’s this little sign explaining what their sweets contain and then the little letters appear on each bin. Now, if you look closely, you’ll notice there are only ‘may contain traces of gluten’ items, so if slight cross-contamination is an issue this may not be the place for you. Personally I’ve never had an issue. In conclusion, you should definitely pop by for a visit and get yourself a giant bag of sweets. You’ll also probably be surprised by the cost, I bought a fairly hefty bag and it only cost a few euros. Click the banner below to see all the details of this shop on our sister site, Allergy Explorer. I never really venture inside Edeka supermarkts, mostly as the one near to me is tiny and pretty awful (plus, they have nothing for us gluten afflicted). But, I had a tip that the Edeka in the basement of Alexa had a few special gluten free treats on offer, so off I went for a visit, and it turns out they do. Alas, they don’t have any types of gluten free products that you cannot buy anywhere else, but they do, at least, have it from a different manufacturer. However, they do mix it in with all the other produce, so you have to scour the shelves to find things you can eat. Why they do this is beyond me. In this case, Seitz, which I’d never heard of before and haven’t seen it for sale in any other shops. But, a little variety is something I crave and the more competition there is out there, the better the products should become. It was all pretty standard stuff really, the only difference as that they use chickpea flour in their pasta (albeit combined with the regular rice and corn flour), which might make a little difference in texture, at least one would hope (I’m a little sick of corn pasta). 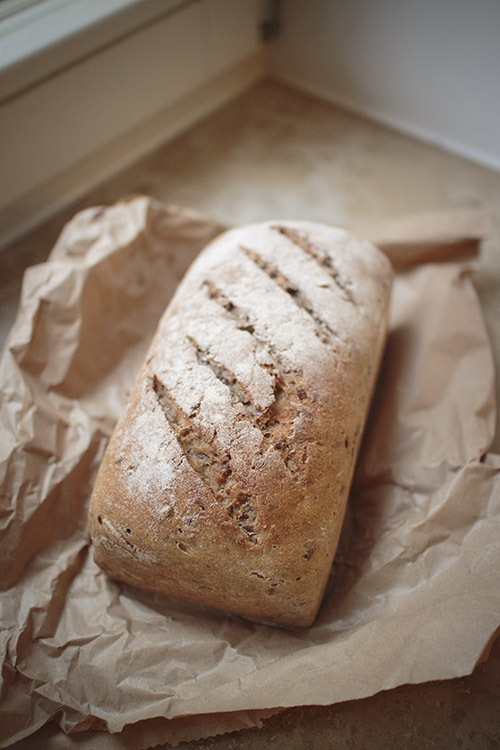 *** Update November 2011 *** – They are having issues with their fresh bread so its worth checking first if they have any. 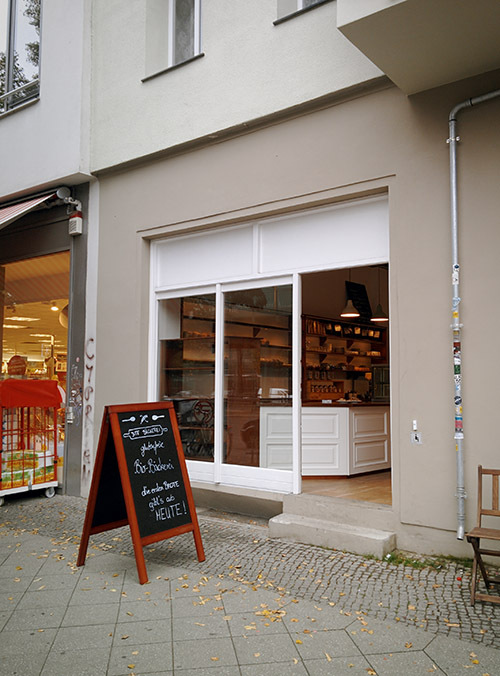 Whilst wandering the streets of western Kreuzberg the other day, it occurred to me that I have not yet reviewed (and hardly visited) an Alnatura store, mostly as there are none near to where I live. I figured there would be the standard offering of gluten free pastas and flour scattered throughout the shop with nothing much to write home about. So, when, a couple of metres in from the door, I was greeted with this, I was quite surprised. That’s right, a little basket full of freshly made glutenfrei bready treats! I quickly grabbed one of the (I think oddly shaped) round loaves. A little further round the store I found some of the more usual glutenfrei offerings tucked in amongst gluten laden products. And, again suprisingly, a dedicated gluten free section. Which, of course, didn’t contain all the gluten free items in the store, just a curious selection. But, the astute amongst you may notice, they are not your standard Schär or Hammer Mühle offerings, they’re mostly from Alnavit, a welcome change. Price wise, about the same as most of the bio/specialist shops here. In conclusion, if you’ve never been, is it worth a trek out to one for a visit? Yes, a little variety is always good in my book. I do love the excitement of a new shop opening, especially when they have a certain gluten focus (even if, as here, it isn’t their main focus). Mostly as I love wandering around, checking all the shelves and seeing what unknown treats are hiding within. With Veganz I was a little more excited than usual as I’d been to their stand at the recent Vegan festival in Alexanderplatz, bought a couple of pieces of gluten free cake and stuffed my face happily. I’d heard that not only were they a markt of sorts but that they had a cafe serving freshly baked (in house!) cakes. Joy indeed. First, though, was a perusal of their shelves. I was minorly disapointed, although not surprised, to see that the gluten free food is mixed in with the rest of the food. It seems to be a fairly standard practice here. Meaning I’m sure I missed a few gluten free goods as they simpily were not labeled clearly enough. For instance, can you tell why I took the top photo? No, it’s not the gluten free pasta. It’s not the quinoa. It’s the cous cous, one box made from corn, one from rice. But if you didn’t look closely at everything, you might just skip by it. The frozen section is a little average, but far better than you’d get in most places. There are a few different types of pizzas but not a whole lot else (hopefully this will change in the future). But, their biscuit (or cookie if you’re from more distant lands) section, is amazing. I noticed brands imported from both the UK and US. The difference between the horrific werz glutenfrei cookies and the doves farm cookies is night and day, I’d say the difference between eating compressed sugar and sand bars with actual cookies. Also, for those of you lactose afflicted, they have a pretty good alternative milk selection (plus a good selection of ice cream). All in all, the shop is pretty damn good. There is a more varied selection here than in other places and most of what you can buy here isn’t for sale anywhere else that I’ve seen. The downside is that you are going to pay for it, a large frozen gluten free pizza is going to set you back around €10.50, the Against the Grain cookies were €5 a box. But, it is pretty specialist and mostly imported. I plumped for the banana chocolate cake and it was quite delicious. The downside was that there are only around 10 seats inside and 4 outside, meaning on a weekend (or, for that fact, the weekday that I went on) you could struggle to find a seat. Here’s hoping that they get some outside tables for the rest of the summer, but, at the end of the day, it is more of a shop than a cafe. The good combination of these means that you can go on a Sunday when the cafe is open and sneak a few items from the shop to purchase. In conclusion, do I like Veganz? Yes, very much so. I’m just not sure whether I like the fact that I like it. Do I recommend that you go? Definitely, and soon, it’s just that your waist line and wallet might be angry afterwards. 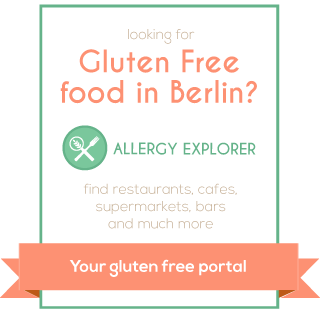 As I’ve been bemoaning the usually small selection of glutenfrei goods in most shops here, I thought it about time that I visit a (mostly) gluten free dedicated place, Anderskorn in Kreuzberg. Look, a sign, outside a shop, proclaiming that they sell freshly baked gluten-less goods! Wonders never cease! I wandered in to find a rather tiny, but well stocked, little shop. Pretty much 90% of the shelf and store space is taken up with glutenfrei wares, most of it is of the gluten replacement variety with some other foodstuffs that are equally glutenfrei. Infact, they take this so seriously that the only gluten items are locked away in their own sealed glass container, just to the left of the fridge, like they contain the plague or something (ie. the correct way to treat gluten poisoned things). The staff are helpfully friendly and as you can see on the right of the picture above they do stock freshly baked muffins and such (although they only had brotchen when I was there). These are made off premises by a bakery in Schöneberg and whilst its good that they’re fresh, they’re not all that much better/different than all the pre-packaged stuff they sell. Maybe the muffins are better, if you’ve sampled them, please comment below. The only downsides to the place are that the selection is fairly standard, you can buy everything that they have in other places around the city, but crucially, not all in one place. Also, it is a little on the pricey side, but as with it being a small self owned business, the customer service level is far better than you’ll get in viv etc. I’ve never really shopped at Kiepert & Kutzner much myself, even though it is within 10 minutes walk of my apartment. The problem being that as good as it is being a Bio-Lebensmittel, its pretty terrible at being on my list of places to buy gluten-less goodies. 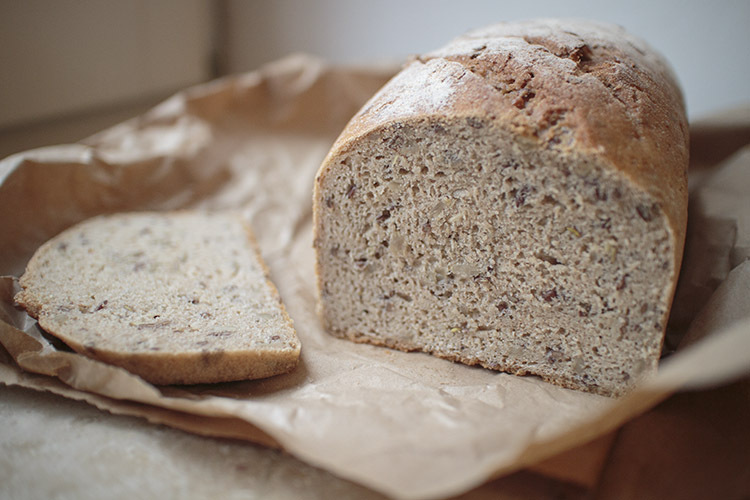 Gluten free items are thrown in with other non-glutenfrei products. Making someone look through all the things that they cannot eat to find one or two things that they can is just cruel, not to mention a waste of time. But, at least they do have some things, but its nothing too special spread out across the store. The second problem, and something which compounds the first, is that they do have a gluten free section! What criteria is used to decide what goes in this section and what doesn’t is beyond me. Now, I could forgive them if they had an amazing selection. But, they don’t. Its mostly from the horrific Merz company (read : gluten free from 10 years ago, bland and rock like) with a few others thrown in. To make matters even worse they have Dinkel (spelt) crackers and bread in the middle on the top shelf, which to me, shows a blatant lack of knowledge about gluten. In conclusion, its a great organic shop but avoid if you’re looking for gluten-less treats. Well, that is apart from the fact that they sell buckwheat crackers, these alone are well worth the trip here.